As many as 40 – 50 students from a total of 200, fail in their slope, side parking and 3 point turn of their practical test for Class D license each week. A fellow instructor, who was having a conversation with me, wanted to know why so many students failed these parts of the test. Below are 5 answers provided by me to him. 1) The element of luck. To be successful in business or exams, “luck” plays a great role. Some people say, if “Haley’s Comet” happens to be crossing by on the day you’re doing your test, well, obviously you are on your way to success. Whether you believe in this concept or otherwise, is up to you. How many times have you actually done the above maneuvers? Two times? Three times? The fact that you feel nervous, is a clear indication you have not learnt or practiced enough. A student who has been provided sufficient time on the above procedures, will be confident. 3) Using a total new car for test. Don’t forget, on test day, you are given a totally new car to do your test. New means a different car from the one you practiced in prior to your test. You are actually not acclimatized or “used to” the car. So how on earth are you expected to perform well on test day? Whether you get a new car or an old junk (if you’re unlucky) makes little difference. The fact is, you’re simply not used to the car you have to use on test day. In such a situation, obviously, you are going to fare rather badly. 4) Condition of test differs completely from practice runs. Students always remark, “I could perform well during practice days”. Well my dear friend, test days are not the same. The tension you face on test day is different. The testers howling at you and the spectators witnessing all your actions. The nervousness in you and so forth all adds up to causing you to make simple, silly mistakes. And what does all this amount to? Of course, your failing, eventually. 5) Not having taken your breakfast prior to doing your test. Many students make the mistake of not taking their breakfast prior to doing their test. You may think this may sound to be only a minor problem but a full stomach goes a long way in making you a confident person. An empty stomach won’t be much help in helping you pass your test. To be successful in your parking aspects of your practical test, slope and 3 point turn, you need lots of ample practice and as said earlier, also a little bit of luck as well. Well then, best of luck. There are some doubts I need for clarification. 1. 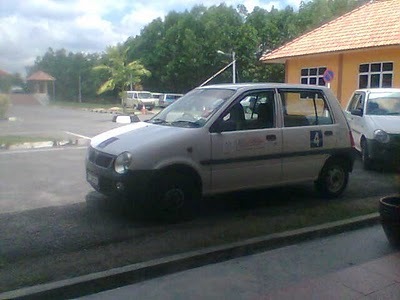 I found out that the car I used to practice with my instructor is quite different with the car I used for JPJ test. I felt that my instructor’s car gas pedal was being modified – I actually used my foot to control ONLY the cluth pedal and brake pedal to perform parking, 3 point turn – no gas pedal was used. So, the time i sit for my parking test, i used the same method during my practise, the car stalls and i hit the pole. 2. Can I apply for using my own driving institute vehicle during my driving test? I am just used to that vehicle. It’s natural your instructor’s car will be different from the institute’s test car. Yes, most instructor’s do not teach you proper use of the accelerator. In reality, your instructor’s car engine timing has been tuned high. You can’t use your instructor’s car during test day. How true. A hot tempered instructor psychologically makes you afraid! according to my instructor, my only problem is that i don’t drive on the middle of the lane and not being able to slow down the car. what should i do? Your instructor means you are driving too near to the side, where pedestrians, bicycles and motorcycles ought to be. Drive in the center to avoid hitting them. To slow down, step less of the accelerator. Dab the brakes where necessary. I would like to ask, when reaching a junction and/or traffic light, how do i control my clutch and accelerator without causing the engine to stall, and at the same time, let the car move freely? When at traffic light / junction (if lights are red), free gear and pull up handbrake. A car with good timing shouldn’t stall. When lights about to turn green, press accelerator more, leave clutch slowly Car should move off nicely. Nice advice to beginners. I am 57 and trying to learn driving on my 1997 Maruti car in a big ground but I am afraid to come out on street as my son says I tend to move more to right than straight ahead and to left. Unless I am able to drive in the street and make turns, he says, I cannot learn driving. So what I should do? Glad this blog is of benefit to you. Although 57, try to get a professional instructor to teach you how to drive properly. We learn lots of driving from experienced learners tips. Hi, cikgu Yap, I just took my JPJ test last week, and I passed my bahagian 2 the parking etc. But when I when for the road test, I started the car, and when I released the clutch halfway, the car did not move.. That is strange because every single car in this world will move when the friction point of the car is reached. My only guess is that the car had been modified to some extent, That make me so confused and nervous on that day, causing me to fail my JPJ test. How can I overcome this problem, and I was thinking why on earth must they modify the car? The fact that other cars in the world can operate on the no gas method, I don’t see the logic behind modifying the clutch. Could you give me some advice on how to overcome my problem. I am taking the test next week. Thanks alot.. Being nervous, I suspect you have not engaged gear one, resulting in the car being unable to move forward. You’re advised to take up more lessons on the road. Hi Cikgu Yap, I failed my driving test…2 portions of it…I passed the slope parking and parking, but I failed the three point-turning, and I failed the road driving….I feel so bad..! How could I avoid being so nervous during the driving exam? Can I request the same driving examiner to be my next-time examiner? From my years of experience, a student is nervous is due to the fact he / she not learnt enough lessons. No, you will not be able to get the same examiner. I want to ask why JPJ always said that I’ve got not enough points to pass on my circuit test? Whats the minimum and maximum marks? And if not mistaken u can get only 15 points off? I lost 7 marks on RPK. But I did everything else on the circuit perfectly… but still I manage to fail because of insufficient points to pass. Also what is the usual rate of retaking the test? My center is charging RM250 for retake and it seems that the usual is RM130 to RM150?